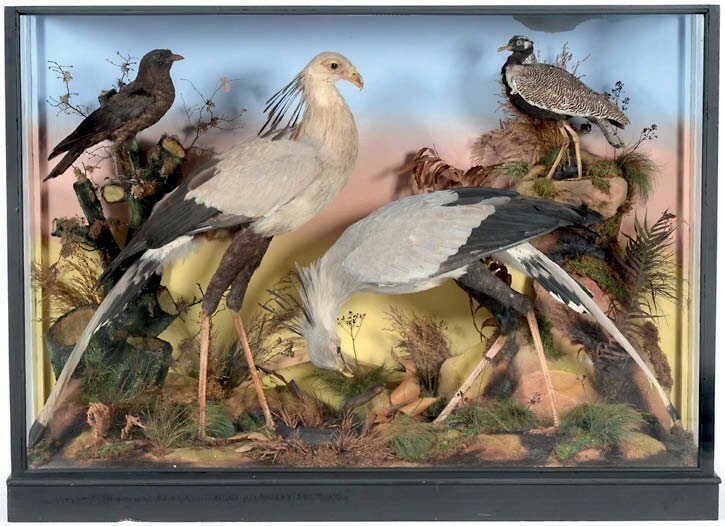 A c.1865-80 diorama of African birds – £12,000 at Tennants. The specialist auction held by pioneering taxidermy saleroom Tennants (20% buyer’s premium) on July 6 drew international interest at the Leyburn rooms, when 90% of the 244 lots got away, totalling £93,000. The major contribution came from three unusually large cased dioramas of African birds, all dated 1865-80 and with trade labels for one of the most renowned 19th century London taxidermy firms: Ashmead & Co, Naturalists, 35, Bishopsgate. Top-seller, standing 5ft 1in (1.55m) high, was pitched at £3000-5000 and went to a north of England collector at £12,500. The same buyer took a 5ft 2in (1.58m) tall cased diorama of African birds of prey at £10,000 against a similar estimate. The underbidder on both was a serious New York collector who was on the phone to auctioneer Robbie Bright as soon as the catalogue appeared online. She was successful at the third time of bidding, on a 5ft 2in (1.58m) tall diorama. The case had been repainted, with some paint leaking into the interior, and the front glass panel had been replaced, but against a £2500-3500 guide, it sold at £7000.